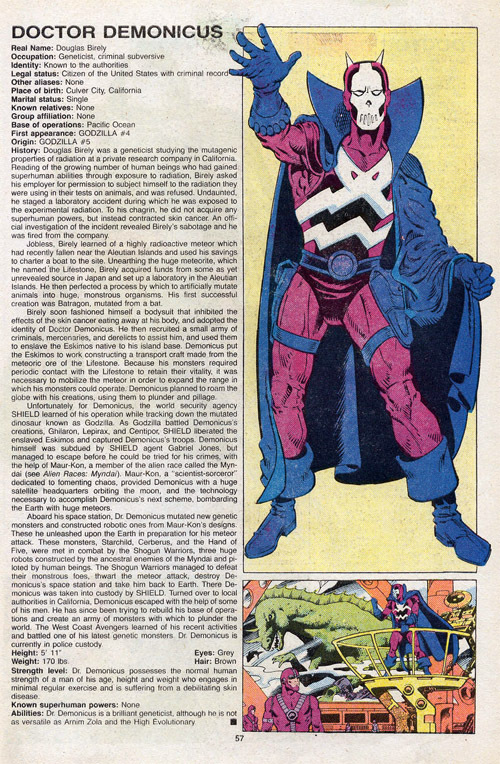 Among Marvel's many supernatural villains there have always been a few demonic overlords that seem to have been derived more or less directly from the traditional Christian Devil-figure. Some of them are obvious from their name, like Satannish or Mephisto, some from their appearance, like Thog (from Man-Thing). But the most interesting and the most impressive to me has always been one that is perhaps less obviously Satanic at first glance: the Dread Dormammu, Lord of the Dark Dimension. 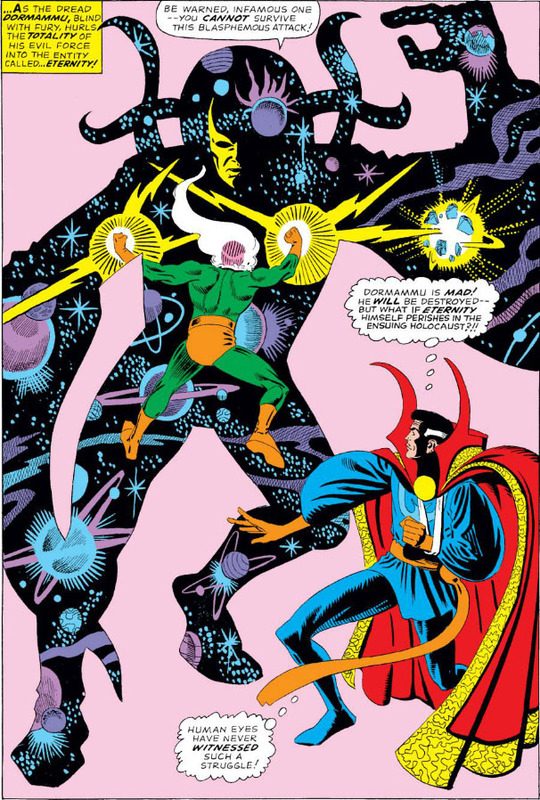 The most impressive for the visual flair of Ditko's design: I always get the feeling of this primal "mystic" energy just barely contained within a (mostly) anthropomorphic form; and the most interesting because he exemplifies the most interesting aspect of the Christian Satan: the cosmic rebel who challenges God Almighty Himself for supremacy (in contrast to, say, Mephisto, who is mostly concerned with corrupting pure souls and so on). In a way, Dormammu is the closest thing Marvel has to a Darkseid, because he's all about the Will to Power in the deepest and most direct possible sense - so much so that, like Kirby's great creation, he might almost be said to embody that concept. From this POV, it seems to me that making his and Umar's origin too explicit and detailed was a big mistake, but of course not everyone sees the characters the way I do. As always with comics and characters written by many different people over many years, I'm picking out the aspects or particular versions that appeal most to me personally. Thanks for posting the pic, Mecha ! From a skeevy looking Golden Age styled Kirby Krook to a sleek modern purple armored baddie leading his own super-team, I love the look of the large helmet, also storage place for his anti-gravity discs. Thanks for the chance to wax villaious over the last 70 years of no-goodniks! !